Delaware Gov. John Carney signs an executive order on Tuesday and appreciated Sikh contributions to America. The state first declared April as the “Sikh Awareness Month” in 2017. In the past, New Jersey and Indiana also have marked Sikh Awareness months. 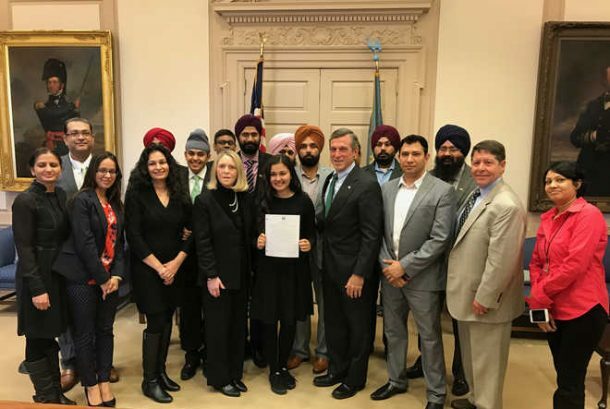 Before the proclamation, the Delaware House of Representatives and the state Senate had passed a resolution that also named April 2019 as the “Sikh Awareness and Appreciation Month.” Gov. Carney said on Tuesday that the contribution of Sikh Americans has been immense in Delaware as well as the United States. On this momentous occasion, the Delaware Sikh Awareness Coalition (DSAC) also organized an interfaith lunch session where the teaching of Guru Nanak and his universal message of humanity and brotherhood was discussed. This year is also significant for Sikhs across the globe as the year marks the 550th birth year of the Sikhism founder Guru Nanak Dev. Sikh civil rights and community-based organizations across the United States have been working towards creating a more inclusive environment for their faith. Especially after 9/11, a spate of racial attacks on Sikhs bolstered the community-based organizations to work toward creating Sikh awareness in the American mainstream. Recently the need of greater awareness was made apparent when an American stand-up comedian Jess Hilarious mistook four Sikhs onboard an American plane and felt ‘threatened’ by their presence. A number of Sikh organizations including the Sikh Coalition came forward to educate the comedian on the tenets of Sikhism and even though the comedian has since then apologized, the incident once again sparked the need of a greater Sikh awareness across the country.